PARIS, France (PAMACC News) – Civil society organisations from Africa, Asia, Latin America and other developing societies have handed over signed petitions to the United Nation Framework Convention on Climate Change ahead of the 21st Session of the climate change Conference of Parties in Paris, urging the leaders to deliver a deal that is fair, equitable and legally binding. 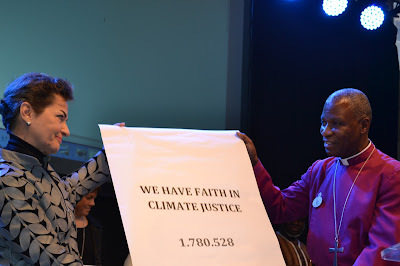 In an emotional ceremony that drove the UNFCCC Executive Secretary Christiana Figueres to tears when receiving the 1.8 million signatures by poor people who suffer the impact of climate change, the civil society representatives said that the Paris conference was an opportunity to correct mistakes witnessed in Copenhagen six years ago. Among the signatures presented to the UNFCCC were some 431,522 from Africa through a campaign led by the Pan African Climate Justice Alliance (PACJA) in collaboration with Oxfarm, ACTS Alliance and faith based organisations. “I stand here when inaction on climate change smells throughout the world, and when the impacts of climate change have escalated in proportions exceeding scientific predictions,” said Augustine Njamnshi, PACJA’s Policy Coordinator. “Climate change is no longer a challenge of tomorrow, but clearly affecting us today,” he told the ceremony that was attended by hundreds of representatives from all over the world. He however noted that time had come for reflection and action, and not for pointing fingers. “It is an historic moment for both those harmed and those who caused the problem, to forgive and forge ahead, as inhabitant of one planet earth. 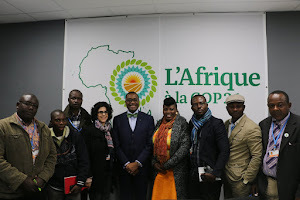 It is no longer time for chest-thumping, but time to break the widening barrier between the North and the South, for we need to bequeath current and future generations a promising future by delivering a Paris Climate Change Pact that is efficient, fair, equitable, ecologically just, and that is responsive to the realities and aspirations,” said Njamnshi. As tears rolled down her cheeks, Figueres thanked all those who signed the petition and wrote messages about problems they were facing as a result of climate change. “I thank you for your messages, your beautiful symbols, for your walking, for your crying, for your singing, and for being who you are,” she said. “I want to thank you for every single step, because with every step, you have shown it is possible to trade lightly on this beautiful planet,” she said recognising that in case we the leaders fail to act now, the most vulnerable people will continue to suffer. The COP 21 climate change talks will take place in Paris from 30 December 2015. So far, all previous talks have failed to deliver cuts in greenhouse gas emissions. And now, the civil society is banking on this particular negotiation to deliver the agreements needed to protect the planet from the worst nightmares of runaway climate change. The organisers of the COP conference say the world needs more ambition.